Memory loss and dementia can make dental care difficult. In the early stages of memory loss or dementia, most people continue to take care of their teeth and brush regularly. As dementia progresses, however, they may not remember to brush their teeth or recognize the importance of good oral hygiene. Eventually they may refuse to have someone put a toothbrush in their mouth or remove their dentures. Good mouth health may be lost in this struggle. That’s unfortunate, because good mouth care is essential to healthy teeth, gums and overall health in elders. With healthy teeth and gums, eating is more enjoyable and tooth decay and loss are avoided. Without regular brushing, people are at risk of infections, chewing problems, weight loss and increased vulnerability to other health conditions. Risks are especially high for people with chronic illnesses such as diabetes, or whose medications cause dry mouth, making it uncomfortable and sometimes painful to chew and swallow food. A dental professional can be an important partner in keeping your relative’s mouth healthy. While your relative’s dentist will be a familiar face, he or she may not be right for your relative. Although many dentists care for older adults, they may not be trained or experienced in providing dental care to people with dementia. Call some of the assisted living homes and nursing homes in your area and ask for the names of the dentists who see their residents with dementia. Your local dental society may also be able to furnish names of dentists who work with people with memory issues—who know, for example, that giving instructions one step at a time will help people who have difficulty processing a whole sequence. Dentists and dental hygienists who work with special needs children often are good with people with dementia. It can help to develop a dental care plan for your relative shortly after the diagnosis of dementia. Make an appointment for a thorough check-up to identify any problems that need attention—gums, broken or missing teeth, infection, etc. Ask your dentist about how often your relative will need dental visits. Especially if your relative is struggling with mouth care, schedule professional cleaning appointments as often as you can, for as long as you can. A dentist or dental hygienist is able to examine and clean teeth and gums in a way that you or your relative might not be able to. Notify the dentist ahead of time about your relative’s diagnosis to make sure the dentist is comfortable and qualified to care for your relative. Tell the dentist if your relative is able to maintain her own dental care or if she needs reminders or assistance. Report any concerns that you or your relative might have: pain, tooth decay, irritated gums, etc. If your relative will be seeing a dental hygienist, ask about her experience with patients who have dementia. Listening to calming and favorite music may help your relative relax during a dental examination. Some dental offices will provide an ipod® and ear buds for patients who are nervous or tense during examinations. If not, ask if you can bring one. If your relative needs assistance turning the device on, ask whether the office staff can help or you need to do this before the dentist starts the examination or procedure. If dry mouth is a concern, give the dentist a complete list of medications and ask if any could be causing dry mouth. Ask for products that can help relieve symptoms. Tell the dentist about any dementia-related symptoms that might occur during the appointment: inability to report symptoms or locate pain, restlessness, inability to follow instructions or answer questions, etc. Ask the dentist about the expected length of the appointment. If you are concerned that your relative might be unable to sit in the dental chair for the required length of time, ask if the needed procedure can be completed in two appointments. 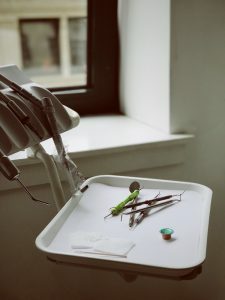 Some dentists may suggest a mild sedative for patients with dementia when a lengthy or invasive dental procedure is necessary. Consult your relative’s primary care doctor about the dentist’s recommendation. Avoid possible wait time by calling ahead and asking if the dentist is on time. Consider how long in advance to tell your relative about the dental appointment. If you think advance notice will cause her to be anxious, consider telling her the day before or the day of the appointment. Ask the dentist if you can stay in the examination room during the procedure if you think your presence will help calm your relative. After the appointment, praise your relative for a job well done. Prepare for your relative – and you – to be tired, as it is likely a great deal of energy went into preparing for and getting through the appointment. If possible, try to plan the rest of the day to be quiet. Grace began to notice that her husband Otto was not brushing his teeth regularly. One day he began rubbing his jaw and wouldn’t eat. Grace looked in his mouth and saw that his gums were swollen and red. She was worried about getting him to the dentist and how he would do once he was there. She called the dentist, explained the situation and told the dentist that Otto had Alzheimer’s disease. She cautioned that Otto might not be cooperative. Otto did quite well during the abbreviated appointment. Grace felt that the dentist was more comfortable because of the background information she gave him. More information on oral hygiene and strategies to try to keep your relative’s teeth and gums healthy can be found in our book, Coping with Behavior Change in Dementia: A Family Caregiver’s Guide, available at dementiacarebooks.com.